Congratulations to Tom Brook, David Trotter & Steve Hodgson who raced into the Club records over the weekend. It's pleasing that their record-breaking rides formed part of our Club's Open 10 on L1015, the Levens/Lindale course on Saturday evening. Tom's time of 20:08 makes him the fastest ever Lancaster Cycling Club rider over 10 miles, beating the mark of 20:24 set by Ryan Coulton in the Club 10 on the same course just a few weeks ago. Tom's ride placed him 8th of 106 finishers, and just over a minute back from winner, last-man off James Gullen of Velosure Starley Primal Pro Cycling, whose time of 19:03 was just ten seconds shy of Bradley Wiggins' event record. Not bad given it wasn't a perfect night, with the westerly wind always discernible & gusting occasionally. David Trotter, first-man off on the night, came in 18th place with 20:48, and Steve Hodgson finished 58th in 22:22 to complete the team of three. The trio's combined time of 63 minutes & 18 seconds beats the previous team record of 64 minutes & 34 seconds by one minute & 16 seconds; this was set by John Ingham, Phil Barnes & Graham Atkinson on the same course back in 2010. With so many LCC riders going so well of late, it'll be interesting to see whether any other Club records tumble this season. Our open 10 was superbly organised by Ken Peasnell, & a whole team of volunteers helped make everything run smoothly - but a special shout-out to Club Secretary Tim Norton who held everything together on the night. And if you've ever thought to yourself you might be getting a bit old for racing, amongst many outstanding rides on the night, how about Cyril Wynne's, of Stretford Wheelers CC? 10 miles in 28 minutes & 49 seconds, at 85 years young - chapeau! To get the full official results sheet, click here. Our Club-run sportive Le Terrier enjoyed dry if slightly cool & windy weather last Sunday, June 7th with riders of all ages & abilities tackling the various route options (very well done to the youngest participant, nine-year old Amelia Wood, who completed the shortest but nonetheless still long & very hilly route!). Feedback suggests the ride was again very well received by those who rode it, with many positive comments about the friendliness of the volunteers, deliciousness of the refreshments, splendours of the countryside, quietness of the roads, & quality of the overall organisation. So well done to everyone - all those who rode, & all those who made it happen! If you've not seen them already, you can access the full results on Le Terrier's dedicated web pages, here. Almost certainly the best evening of the year so far down at Salt Ayre - warm, dry & close to windless. And the best turn out too, with a total of 94 riders across the three distances; 18 at two miles, 31 at six miles, and 45 at ten miles. It was great to mingle over a cuppa afterwards, to hear about people's tumbling times, and to witness the quiet smiles of satisfaction spreading across their faces - a modest but well-earned pleasure. Ian Richardson completed only the first few laps of his ten mile time trial, and therefore inadvertantly won the two mile time trial by a good margin, in the year's fastest time of 4:44. Jack Tipler was second in 6:00, and Max Davies third in 6:18. Fastest girl was Emilia Wood in 6:33, with Esther Wong not far behind in 6:39. We saw the year's fastest rides at six miles too, with George Mason winning in an excellent 15:04, followed by Bobby Horton in 15:21, and James McCracken in 16:00. Honours for fastest girl were shared by Evie Barrow and Sasha Oldham, both recording the very good time of 16:58. A superb battle at ten miles, with three of this year's best performing riders all cracking 22 minutes and separated by mere seconds; Andrew Horn taking the win in 21:44, from Sam Monkhouse in 21:47, and George Wharton in 21:53. Among the many other notable performances, young Ben Barlow finished in 22:50 and 5th place, finally beating his dad Andrew, by 11 seconds. With Lynn Hamel volunteering track-side, the competition for fastest woman was close fought, with Alison Oldham in 26:07 edging out Jenny Evans in 26:39. Very well done to all riders taking part, including those - such as 13 year old Ben Keenan with his sparkling brand new bike - tackling a time trial for the very first time. It's always really, really great to see new faces down at the track, and to watch them test themselves over whichever distance. At Salt Ayre next week we'll be having a mid-season BBQ and the presentation of prizes for the best rides of the season so far. 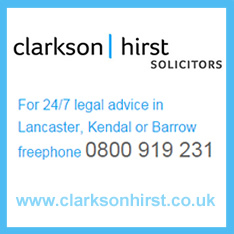 Very kindly sponsored by Clarkson Hirst Solicitors, there's £25 for fastest, £15 for second fastest, and £20 for best gauged ride so far over each of the distances (with younger riders only eligible for the two & six mile prizes). So let's hope for another good night, and we hope to see you down there! As ever, thanks to all who helped on the night, and full results available by clicking on 'Read more' just below.